Reception at Calama airport by your guide and transfer to San Pedro de Atacama (2438m). In the afternoon we cross the Death Valley and stop at the “Three Maries”, curious rocky formation that looks like a statue. Then we reach the Moon Valley before sunset, to enjoy the charming twilight from the Big Dune. We dedicate the morning to the exploration of Catarpe’s Valley. We start by visiting Quitor’s pucará (fortress), dated from the 12th century and occupied by the Incas to fight against the invasion of the Spanish. Then we visit the area of “Tunnel” from where we have a spectacular view of the Salty mountain range, with some impressive mineral sculptures made of salt and clay, carved by the wind and the rain. We continue to San Isidro’s small church; and the ” Quebrada del Diablo ” with incredible rocky formations. 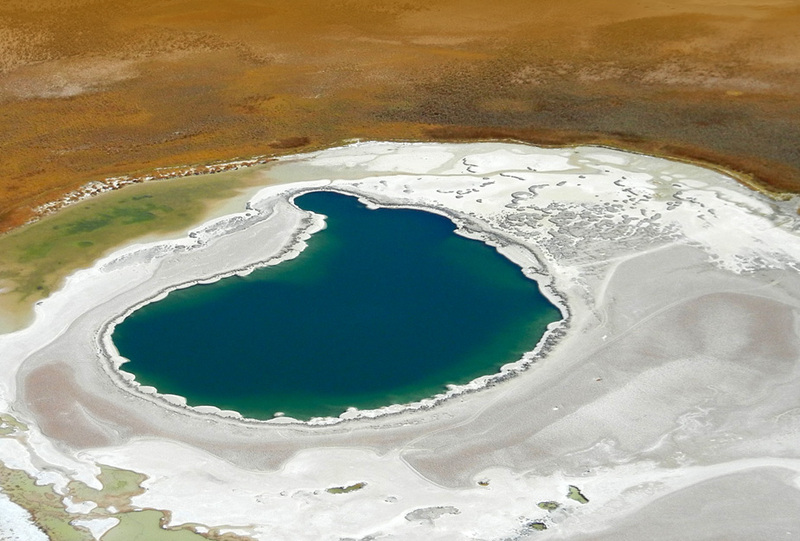 In the afternoon we visit the lagoons Tebenquique and Cejar, located in the heart of the Atacama salt flat. The Lagoon Cejar has a very high concentration of salt that will let us float without efforts, just like in the Dead Sea: a memorable experience! We hide to the village of Toconao and the Chaxa lagoon, in the immense Atacama Salt Flat. 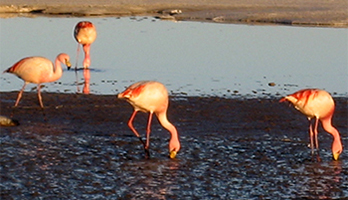 With more than 3.000 km², the Atacama Salt Flat is inhabited by different species of flamingos. We continue to the dazzling Miscanti and Miniques lagoons, located at 4200 meters where we can watch a varied fauna, such as the giant Tagua bird. Return to San Pedro. Early morning departure to Tatio Geysers (4321m), well-known for the steaming vents and pools of boiling water. Possibility to have a bath in a natural pool. On the way back to San Pedro we visit the area of Guatin where we can find giant Cactus. Free afternoon to rest. In the morning we drive to the Bolivian border of Hito Cajón. After the customs checks we enter Bolivia and visit the White and Green Lagoons (4400m), whose colour is due to the concentration of minerals (lead, arsenic, sulphur). Stop at the impressive geyser Sol de Mañana (4850m), with its infernal steaming vents and the strong smell of the sulphuric vapours, before we reach Laguna Colorada (red Lagoon), (4278m). Its intense red colour derives from the seaweeds and plankton living in these waters, so rich in minerals. The view of the numerous flamingos in this sector is unforgettable (in this place we can watch the 3 species living in Latin America: the Chilean, the James and the Andean flamingos). We continue to Ojos de Perdiz. We continue to the área of lagoon Hedionda. We continue our voyage across the Sud-lipez until the small village of Colchani located on the edge of Uyuni salt flat. Here we will learn about the way of extracting and processing the salt. Full day excursion in the salt flat, whose surface is more that 12.000 km². We visit Incahuasi Island and its huge cactuses, in the hearth of the salt flat. The amazing view on this white sea is definitely one of the highlights of the tour and a memorable experience. We continue to the small village of San Pedro de Quemez, witness of the war between Chile and Bolivia. On the way we visit the Galaxia cave, with numerous cactuses and stalagmites as well an ancient cemetery and learn about the burial habits of the former inhabitants of this region. After breakfast, we continue towards the border of Ollague to meet our Chilean driver. On the way we can observe the volcano Ollague (still active) and volcano Tomasamil. Arrival at the airport of Calama in the afternoon. •	Meals as mentioned in the program. •	Private transportation during the whole program. •	Local bilingual guide(s) during the program. •	Museum and Park fees for the excursions mentioned in the program. •	Astronomical tour in regular service. •	Meals not mentioned in the program. •	Alcoholic and soft drinks during the meals at restaurant/hotel. •	Services NOT mentioned in the program.